Kabul Bombing Kills At Least 6; ISIS Claims Responsibility : The Two-Way A suicide bombing near the Afghan intelligence agency early Monday morning killed six people, including at least one person who was traveling in a passing vehicle. Afghan security personnel block a road near the site of a suicide attack in Kabul on Monday. 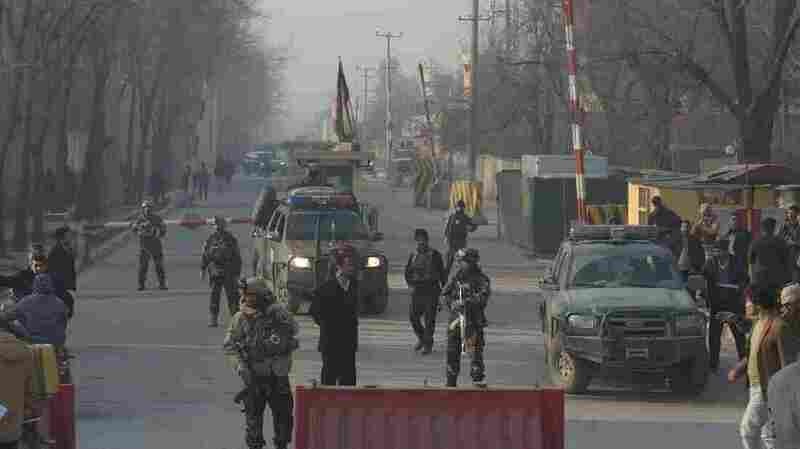 A suicide attacker on foot blew himself up near a compound belonging to the Afghan intelligence agency in Kabul on December 25, killing six civilians, officials said. A suicide bomber in Kabul killed at least 6 people in an attack early Monday, near the Afghan intelligence agency. The Islamic State has claimed responsibility for the attack through its news agency Amaq. One of the victims was a woman traveling in a car as it was passing by the site of the explosion, The Associated Press reports. The exact target of the attack is unclear, the AP says. Reuters, which confirmed five deaths with the Afghan interior ministry, reports that all of the known victims were civilians. NPR's Diaa Hadid, reporting from Islamabad, notes that the attack comes just one week after ISIS stormed a different security compound in Kabul. "The militant detonated his explosives near the main entrance of the agency compound early on Monday morning – just as people were in traffic heading to work," Diaa reports. "ISIS emerged in Afghanistan two years ago. Since then it has targeted security forces, eroding their already low morale," Dia says. "The group is heavily targeted by U.S. airstrikes and by Afghan forces. The attacks in Kabul seem to be a way to show that they're still powerful." President Trump has been briefed on the attack, according to White House Press Secretary Sarah Sanders.